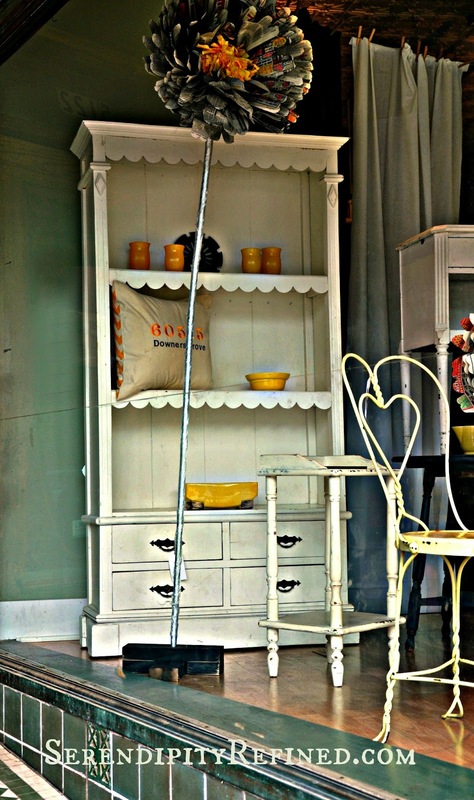 I did some restyling at the shop over the holiday weekend (Vintage Fresh in Downers Grove, IL). 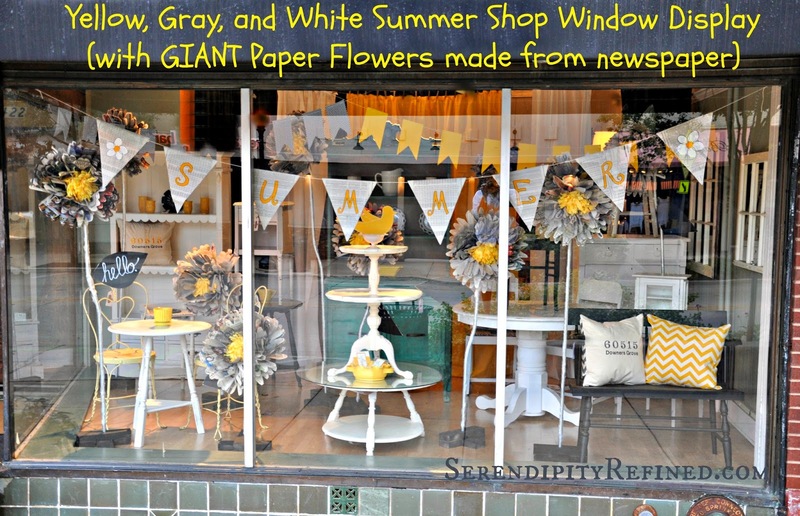 I installed a new summer-themed display for the shop window which includes a newsprint banner and GIANT free-standing newsprint flowers with tissue paper centers that I created. 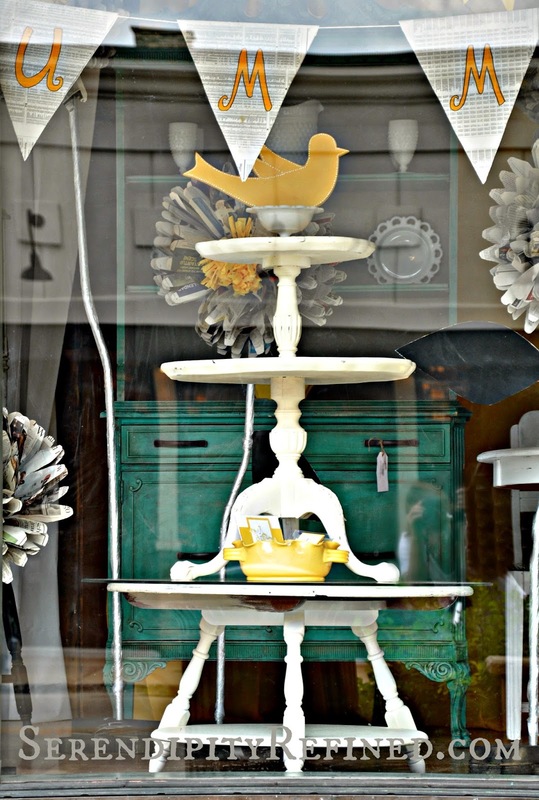 I wanted the window to feel fresh and happy and to focus not only on summer but also on the shop's specialty: painted furniture. I actually started the window transformation on the morning of July 4th. Thankfully, Erin and Kelly were willing to meet me at the store for a few hours before we all went home to celebrate with out families. Since the 4th was on Friday, I wanted to take advantage of the long weekend to have the new window complete before Monday morning. It's time to move on, people! I also discovered that it was fun being in the store on Independence Day. Our village has a 4th of July parade and there were lots of happy families walking past the window and stopping in to visit and shop on their way to and from the route. There were lots of "Oooooh's and Aaaah's" and plenty of "WOW, look at those flowers!" My favorite comment to date was on Sunday evening, when I was outside taking the photos for this post. As a group of 30-somethings walked past, one of them said, "It's like Anthropologie meets Pinterest...on steroids." It made me laugh right out loud because her comment was PERFECT! 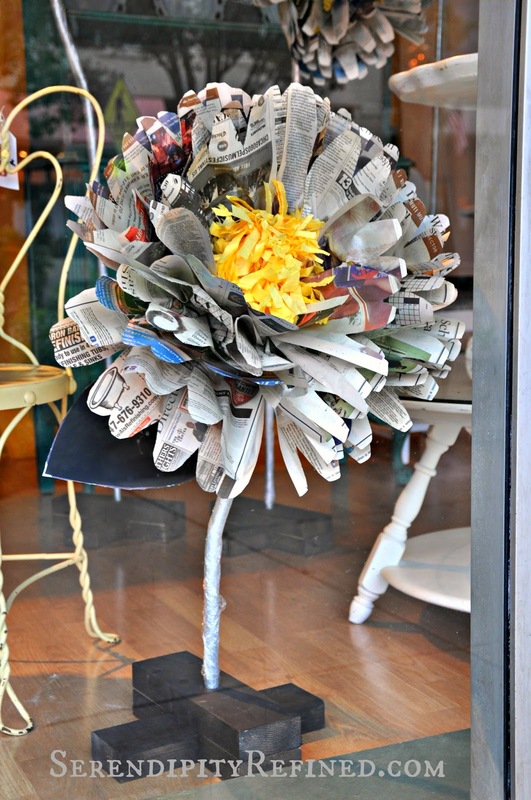 There was one older lady who stopped in on Saturday who said that she felt that the flowers should have been made from "nicer paper" (Which they will be at some point. I intend to re-use the bases...heck, I've already got plans for the next flowers that I'm turning them into!) and another who mentioned that the window was "too bare" but I love the change and the more open feeling. 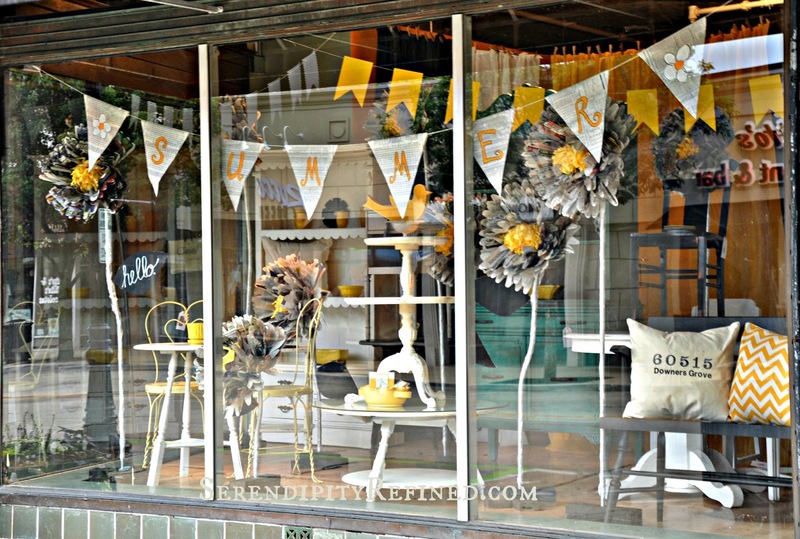 To me, this window says, "It's Summer...time to relax!" 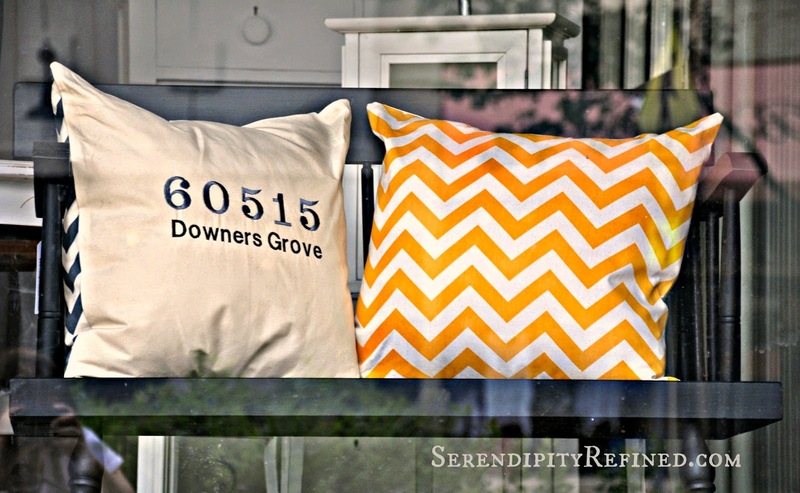 I also made a few paper banners and sewed some chevron and zip code pillows in yellow and gray but other than those and a few select vintage items, the window focuses on the shop's specialty and what I love most: rescued and repurposed painted furniture! The shop has a large selection of already painted pieces and will be offering furniture painting classes beginning in late summer or early fall. Of course, if you're local and you have a piece that you need painted, I'm always willing to do that for you! I'll be posting shop announcements about classes as they happen for those of you who have asked when I'll be teaching paint classes. Erin and Kelly have some great stuff planned for the late summer and fall with some exciting announcements on the horizon! 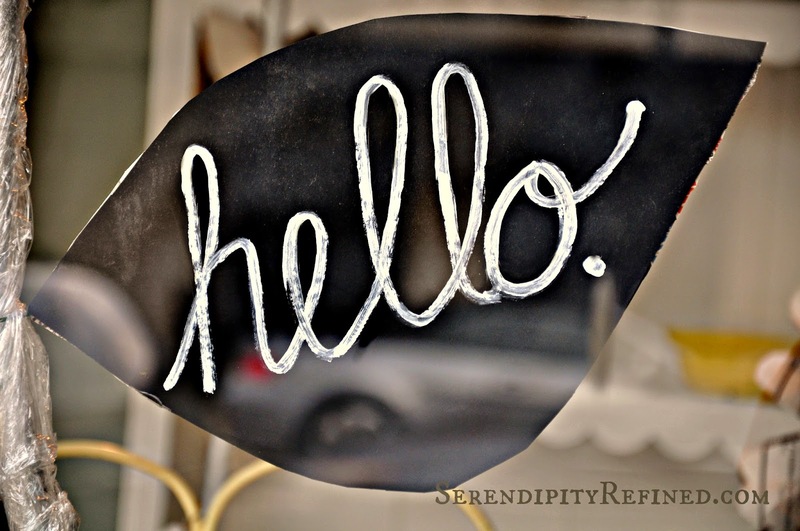 I hope that you enjoyed this little peek into my favorite shop staging job (and my favorite window to date)! 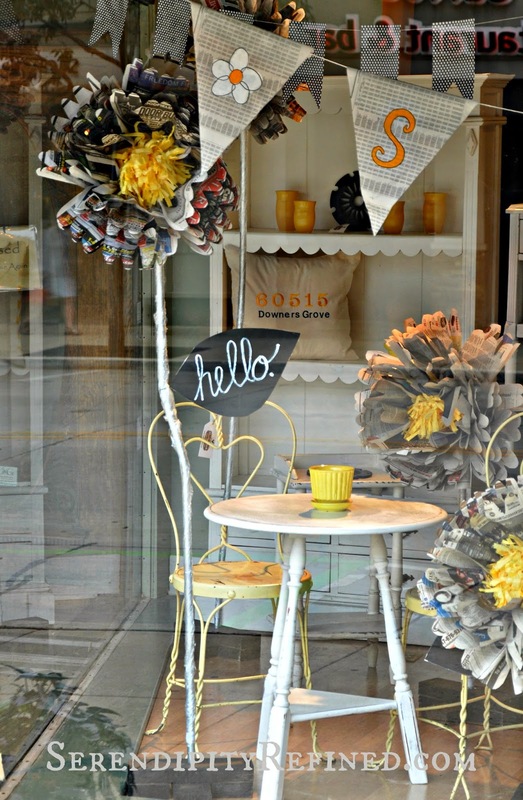 Creating this sunny summer shop window display with paper banners and huge newsprint paper flowers was so much fun! 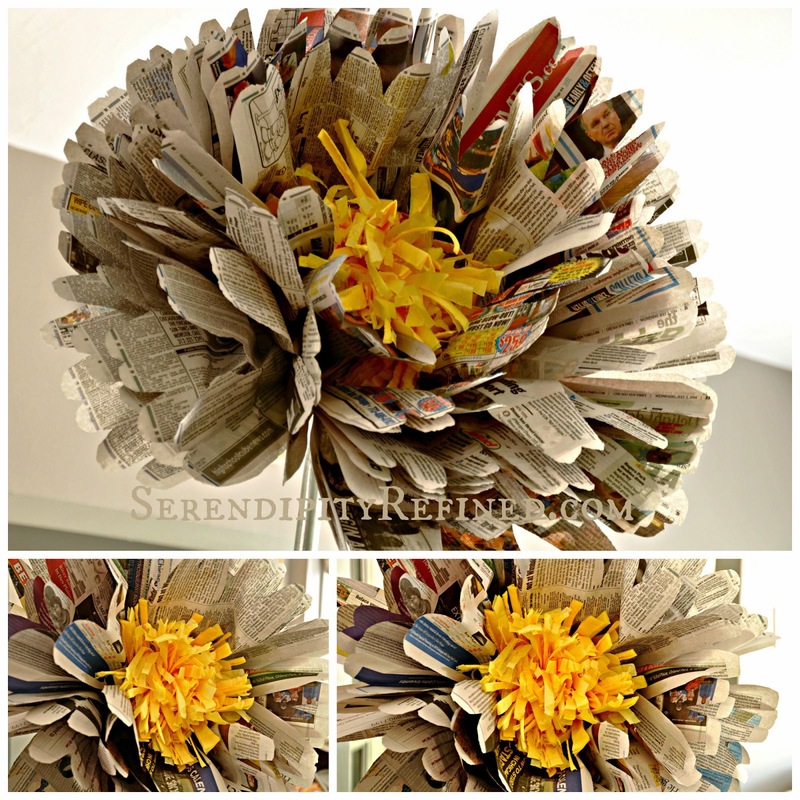 If you'd like to know more how I made the giant free-standing paper flowers, make sure that you stop by next week for the full tutorial! P.S. 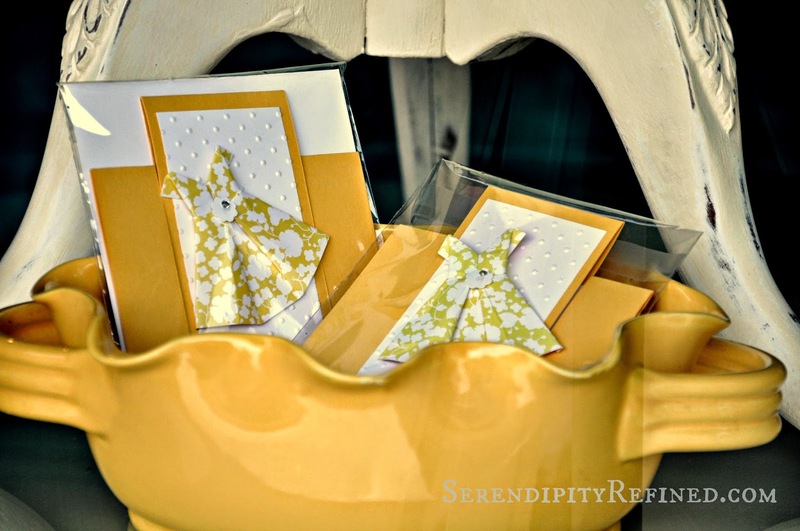 If you're in the area, stop by Vintage Fresh...there's lots of new eye candy!